BlogMeister is another new weblogging tool. It is aimed specifically at teachers and their students. teacher before they can be made public. Things have been very quiet around here lately (for various reasons), but I promise they'll pick up again soon. If not in December, then in the New Year. The staff say it is not a question of national pride, but of discrimination. They claim that people have been denied promotion because they speak poor English, and that those who protest are accused of rejecting the company’s ethos." I must admit that I came late to RSS and Bloglines, but now that I've discovered what it can do for me, I wouldn't like to live without it. If you haven't discovered it yet, try rerading Alex Halavais' article about what it can do for you and give it a try. Thanks to Stephen Downes for the tip. reflect on your teaching experiences. keep a log of teacher-training experiences. write a description of a specific teaching unit. describe what worked for you in the classroom or what didn't work. provide some teaching tips for other teachers. write about something you learned from another teacher. explain teaching insights you gain from what happens in your classes. share ideas for teaching activities or language games to use in the classroom. provide some how-to's on using specific technology in the class, describing how you used this technology in your own class. explore important teaching and learning issues." I've yet to try this out, but Blogbox.com offers "free, open-source rich internet applications for your personal website, wiki or blog"
What I've seen looks good, so I'll be coming back here to try some of these widgets out! Claude Covo-Farchi at http://covonline.com/ has a very colourful blog that will be of interest to many. There are lots of links to ESL sites, and many other snippets that could be used with classes. Hong Kong English teacher: "I would like my students to have perfect English. I would like them to be able to write in a variety of styles to meet different requirements, to be able to write complex interesting sentences that are not filled with errors. I would like them to be able to take part in discussions, to be able to argue their points forceably and coherently in English, to be able to give fluent presentations without pronunciation errors, and to be able to converse in English naturally and confidently. I know this is not going to happen. It is unrealistic. I can have an ideal though." This self-reflective weblog makes interesting reading - it's another good example of a practising teacher using a weblog to reflect upon teaching, etc. "Flush out the writer in children. Blogging could draw out a young writer and open doors to their future." So says Sharon Housley in the post Blogs for Kids at RSS Specifications. Sharon goes on to describe the benefits that blogging can have for children. Althoughnot aimed at an ELT audience, this post is obviously of interest to YL teachers thinking of blogging with their classes, or those who already do so. Jason Ward has an article in the TEFL Web Journal entitled 'Blog Assisted Language Learning: Push button publishing for the pupils. Jason talks about the benefits that blogging can have in the reading and writing classes. The article speaks mainly of the advantages of using blogs. The danger, it seems is that reading by scrolling a computer screen can lead to a 'superficial and often inaccurate, understanding of the content, and that sloppy writing can result from blogging. Jason also mentions that the commenting feature of weblogs can lead to confidence being undermined if students receive criticism from others. All the more important, therefore, to ensure that blogging with students is controlled? Perhaps by restricting the commenting feature of student weblogs to those enrolled in the class? All of this is mentioned briefly in Jason's article and deserves to be expanded upon by someone. Any takers? The second part of Jason's article outlines his own blogging experience with students, and the results. These results showed that his students overwhelmingly preferred the blog to the regular journal, and seemed to have told others about the weblog. A large majority also believed that using a weblog would improve their English, although many were unsure at the time of the survey whther they would continue with the blog. George Siemens at Elearnspace has written an article (complete with useful mindmap)about the different categories of e-learning. Many-to-Many is a group weblog concerned with social software. It's definitely worth taking a look at. From there, the first thing I jumped to was Adina Levin's BookBlog, which has a great discussion on what's new and who's doing what in social software. I have started to blog with this year's ERASMUS students, who are over in Barcelona until Christmas. I have them for a class on Catalan Culture, introducing them to the culture and history of Catalonia (and how this is similar to / different from Spanish culture). Last year I set up a class weblog for this group, and although the experience was positive, and some of the students continued blogging there after the course, I found that having just one weblog between 25 students made it difficult to keep track of what everyone was saying. I also used the weblog as a way of grading them, and it was not easy to evaluate as all posts were on one site. Finally, I asked them to set up an account, and there were problems (with students forgetting passwords and user names). and also individual learner weblogs, linked to the class weblog. I actually set up all the accounts for the students and gave them their logins and passwords. That way I set myself up as Administrator on all the accounts and fixed the settings to help the functioning of the weblog community. Bernie Dodge compiled this chart for use during his EDTEC Saturday Seminars on Motivating Student Writing with Weblogs. On the site you can find a course overview, an outline and resources. The discussion section of any collaboration is done in a blog. Descending from the words 'web log', a blog is basically a journal that is available on the web. Postings on a blog are arranged in chronological order with the most recent additions at the top. A blog is a perfect arena for discussions where you can attribute who is saying what and when they said it. This allows a group of people to focus on certain parts of a collaboration. For example, if I noticed that a paper we were working on needed more citations, I might say so in the blog. It is the first page people see when they come into a project, so any news of interest that might be inappropriate inside the project should go there. " Contentious Link-Only (Basic Blog Post Formats, Part 1): "This is part 1 of a 7-part series that describes the main types of blog posting formats." and more "News and musings on how we communicate in the online age"
Aaron Patric Campbell writes: "I recently wrote a short piece for the Internet TESL journal describing how I added an experiential element to my EFL reading/writing classes last spring through the use of Livejournal. Students wrote weekly and were able to interact with the peers from abroad in the target language. It was educational and fun for everyone involved. The paper is entitled, Using Livejournal for Authentic Communication in EFL Classes." I've been following some links on docendodiscimus, a weblog run by Peter Williams with content of interest to EFL teachers. One link led to an interview at Weblogs in Education with Will Richardson, whose weblog Weblogg-ed.com is a great source of information for educators who want to use weblogs. In the interview, Will says that "From a teaching standpoint," weblogs are perhaps best used as "online classroom portals, discussion sites, filing cabinets for handouts and syllabi, collaboration spaces and personal portfolios." He also thinks "the easiest place to start is to use the Weblog as a homepage for a class to post homework assignments, links, discussion questions." There followed a discussion on Slashdot that caused such a commotion that the gmail blog was turned off, but the author plans to reinstate it once the fuss has died down. There's a lot of interest related to Google's gmail accounts because of the space they provide for free (1GB), the organisational aspects, search facilities, and akso the anti-spam element. I have been trying out gmail and I am very impressed with it. Unfortunately, it's in a beta (testing) phase and is open to new members by invitation only. However, I have lots of invitations, so if anyone wants one, just leave a comment on this post and I'll send you an invite. Eastgate Tinderbox: the tool for notes may be an interesting option for Mac users looking for a sophisticated weblogging tool (and more. Here's what they say about it: "Tinderbox is a personal content management assistant. It stores your notes, ideas, and plans. It can help you organize and understand them. And Tinderbox helps you share ideas through Web journals and web logs." It's not free, however. The nymber of articles on blogging in education increases every day. Here are two more I came acros: Exploring the use of blogs in the higher education sector is an article from the Australasian Journal of Educational Technology, and When Blogging Goes Bad: A Cautionary Tale About Blogs, Emailing Lists, Discussion, and Interaction is an essay showing a different point of view. There's a discussion of this essay at Kairosnews, "a weblog for discussing rhetoric, technology and pedagogy." Furl - The Aaron Campbell Personal Webpublishing Research Archive is a good place to start looking for articles about blogging. Dear Ai - Good advice for ESL Students seems to be a first - a weblog "agony aunt". Students are encouraged to write to Ai, and she answers their questions and gives advice about their problems about studying English in Vancouver. TESL-EJ On the Internet: Diaries as introspective research tools: "This article reports on a study of the usefulness of a diary as a research tool conducted as a part of a Masters degree program in TEFL/TESL at Birmingham University, UK. The study analysed the efficacy of using blogs as a research tool compared to diaries, using the example of research in teacher use of motivation strategies, and found that blogs offer various possible advantages in the domain of action research." what's the word, wiseguy? is a blog by John Kuti "about the cultural and linguistic gap between English and Russian, life in Saint Petersburg, teaching and learning languages." I got this link from John's blog: The history of CALL. I tried searching for 'weblog', but the search returned errors. I looked via the index but it seems there's nothing on weblogs yet. After all, it's a site about the past, I suppose, not the present. http://www.questionpro.com/ isn't a blogging tool, but it may be of interest. It's "An Integrated online service for Building Surveys, Collecting Data, and Viewing Results in real time. Free for Academic and Research Organizations." Has anyone had experience of using this? "The department chair murmurs, that's very interesting, but we haveour hands full with online courses. You need to start teaching and stop wasting time with these toys." Once again, thanks to Jason for this link: Everything you wanted to know about blogging but were afraid to ask at Simon World. Simon's article is, as he says, not the first to deal with this subject, but it is well written, and he has some very good advice. I personally like the "Never get your brother to guest blog for you" bit. Intriguing, Simon. what happened? Knock knock, who's there? is "A blog for all students, colleagues and anyone else who's interested in discussing the intricacies of the English language", run by a colleague of Jason's (see previous post). The site has started posting texts written by students. "I have set up another 'motime' blog for my class. It is called Y5R (the name of my homeroom class). One of my main concerns all along has been that in order for my students to have their 'own' blog they would have to sign-up with a free service... If you have any suggestions about how I can solve this problem with the students not have an e-mail account please pass them along!" Can anyone offer help to Jason? You can find this entry and others at http://wjreagin.motime.com/ - it seems as if Blogger is blocked in China, and so he has set up a weblog with another provider. The piece elise.com: On the Job: An Overview of the Weblog Tools Market by Elise Bauer gives a nice summary of the current situation with weblog tools. Of course, Blogger is the leader, with Livejournal following closely behind. More hosted services are mentioned in the article, as are weblog tools such as Wordpress, Drupal and Greymatter, which require installation on a local server, and so are normally more popular with more technically-minded bloggers. The article goes on to show perceived market share, and which tools attract which type of person. There are other example blogs given on Barabara's presentation, so be sure to check it out. Stephen Downes has written an interesting Educational Blogging article in the Educase Review, "looking at the nature and history of blogging, educational applications, tools and technologies, trends, and early experiences in educational blogging." "This virtual space is composed of three sets of weblogs, or blogs: a classroom Web space, where announcements are displayed and work of common interested is posted; a public, personal communication zone, where students post the results of their work or reflection; and a private personal space, reserved for students’ thoughts and teacher guidance." and the point of this is "to promote reflective analysis and the emergence of a learning community that goes beyond the school walls." There is a more detailed description of the workings of this at the Institut St Joseph site, and the public 'tutor' weblog site and the 'class and student' weblog site can also be examined. One thing I find is interesting about this project, which looks highly organised and professional, is the avoidance of using the term 'blog' or 'weblog'. They use the term 'cyberportfolio' instead, which does not need explanation. In the past, I have had problems communicating to students the concept of the 'weblog', and some students ended up thinking it was a kind of 'forum', but this was not a good idea, especially a forum is an impersonal space that people contribute to sporadically and infrequently, and the idea behind a weblog is that the contributions should be regular and personal. The article also discusses many aspects of educational blogging, including the idea of using a weblog to assign homework. This is frowned upon. It is also noted that "many writers have noted, writing a weblog appears in the first instance to be a form of publishing, but as time goes by, blogging resembles more and more a conversation." This article is aimed at those involved in marketing, but it's still interesting to see how blogging continues to make headway as a way of communicating to people electronically. "We have recently implemented the use of blogs on our training courses for teachers. We call these blogs 'reflective blogs' as we ask teachers to record their teaching practice through self observation and then reflect upon it. These blogs are kept on our Teacher's Portal and are open to all teachers to read and comment on." Finally, blogging has become a popular feature of British Council websites. After some previous trials, the British Council Glasgow conference for teachers (taking place this week) has four teachers blogging their observations and summaries of the presentations they attend (Sorry, but these sites are only available to British Council staff via their intranet), using typepad. This could become a regular feature of conference events - it's certainly a good way to bring the conference to those teachers who can't attend. It's true there are few comments to the posts on the weblog, but then a lot of teachers will be on holiday at the moment. I also found out that the Britsh Council community for exisitng students (Global Village, again not available to non-BC staff) is also to introduce weblogs to help improve the participation by students in this site. This is an interesting development as I proposed it when I was taking the excellent e-moderators course in September last year, for British Council Global Village moderators to improve their skills. How effective these projects are remains to be seen, but the increase in blogging activity is certainly of interest for edu-bloggers who believe using weblogs hold a great deal of promise with both students and teachers. "In this study, reading performance with four white space layouts was compared. Margins surrounding the text and leading (space between lines) were manipulated to generate the four white space conditions. Results show that the use of margins affected both reading speed and comprehension in that participants read the Margin text slower, but comprehended more than the No Margin text." "To call blogs literature would be to turn them into an elitist, edited, and vetted art, one which is contrary to their very nature. The complexity of what blogs and their reactionary, perfectly contemporary, accessible prose could mean to the future of sustainable storytelling, to truth in journalism and to the survival of democracy, is too great to call literature." Will Richardson's Power Point presentation can be found at this link: Weblogg-ed - Using Weblogs and RSS in Education The presentation provides a well-developed introduction to weblogs in education. Helen Barrett's E-Portfolios for Learning Blog was set up to discuss "ideas on electronic portfolios to support lifelong learning"
The paperCreation of a learning landscape: weblogging and social networking in the context of e-portfolios by Ben Werdmuller of the University of Edinburgh argues that for the 'e-portfolio' system to be effective it needs to capture the enthusiam of online leraner and tutors. As learning is not a solitary pursuit, one way that this can happen is to learn from social networks such as Orkut, and weblogging communities (livejournal being the example given). The learning experience, the paper argues, is enhanced and made more valuable by the participation and interaction of others. Thanks to Stephen Downes for the link. EDUCAUSE REVIEW | July/August 2004,Volume 39, Number 4: "We are still working toward a common definition for electronic portfolios, or ePortfolios.1 Ideally, all work in an electronic portfolio not only is digital but also is available on the Internet. Yet even though materials may be visible on the Web, the ePortfolio is not simply a personal home page with links to examples of work. In addition, unlike a typical application program, such as word processing, an ePortfolio is a network application that provides the author with administrative functions for managing and organizing work (files) created with different applications and for controlling who can see the work and who can discuss the work (access)." e-Literate is a weblog about online learning. I have just finished reviewing the results of a survey I gave to my students of 'Sound and Image' in the last computer class we had. The students were taking English as a subsidiary subject, as part of their Professional Studies diploma in 'Sound and Image'. A lot of these students go on to work in the world of TV, theatre, cinema, as photographers or in other audio-visual contexts when they finish their two year course. The English teachers' job is to help prepare them for this offering a mixture of general English and ESP. My class was upper-intermediate level. We had a computer class programmed every third week and I decided to introduce learner weblogs as a way for them to submit assignments and record the things we looked at in this class. As this was the first year we had regular computer room use and also the first time I had used weblogs consistently with a class, at the end of the course, I gave them a short questionnaire to see how they perceived the experience. I am happy to say that it was very positive, and the majority of the students took to the computer classes (and using the weblogs) with enthusiasm. Obviously, this is what I thought I had perceived during the course of the year, but it's always nice to hear it from the horse's mouth. As a result of their survey, I intend to use weblogs with the Sound and Image group next year, taking into account their comments when the course programme is designed. A more detailed analysis can be found at the Weblog in ELT group at http://searchenglish.britishcouncil.org/, the British Council Search English website. 1.Did you like using the computers frequently? Yes...At first I feared them, but slowly I begun to understand Its way of "thinking" or "programming". Yes, I like a lot, because it is a way to change pen and paper of a typical class.And it is an easy way to give you our homework. 2) What activity did you like most using the computers? The best activity was explain a photo because I passed a great time choosing my photography. Another great activity was the review of a film because I talked about Tim Burton, one of my favourite directors of cinema, as you know. The activity was the red herring, the interactive history was funny. 3) what activity did you like the least? I really hate film's reviews. I think that a reviewing is a very very personal think and people never could be in agree. So, and exemple is the Big Fish review because all classmates liked the film.... except me. It could be that I am a little ... strange. Now I don't remenber an activity that I hated during it realization or after. 4) Did you like using the weblog? Why? Why not? Yes, I did! I liked it so much. I think that it is a good way to connect to other people as another country or just classmates. More of people believes that weblogs are more more similar than kind of "net post-it's" but, I really know that weblogs are a way of communication in internet. I don't like so much, because I only use to do my homework and it's obvious that to do the homework is not very funny. But I think that's a good sistem to do the homework. 5) What do you think students should do next year that we didn't do this year? Future students.... jeje. I will be a future student. In weblogs students should do a great many things like write a photography session; write about them lineage; write about them first love; an assessment about them ideal holidays; what they searching stdudying Image or Why they are studying Image; etc. At Edweblogs.org: NECC 2004, there is an entry on Bernie Dodge's presentation about the evolution of webquests. It seems that one of the criticisms levelled at webquests is that they should be more interactive. Bernie himself has his students write blogs. He says he gets to know them better that way. There is more about his presentation here, hinting at how to integrate blogs and wikis into webquests. Here's a succinct post about the difference between blogs and wikis. ateacher has started a reflective blog at EFL summer school to comment "on classes at a summer school for young learners studying English in July 2004"
In it, they outline a taxonomy of blogs, talk about the relationship between blogs and power, and mention the potential for blogs to become platforms for powerful writing if the author is encouraged to focus upon his/her point of view and identity. "Many student posts to school-endorsed blogs look like being compulsory requirements and linked to student grades for the course. The lively humour and wit of blogger posts elsewhere and the written comments they often attract from readers are missing—few school blogs even have the “comments” function enabled. The quality of writing posted to school blogs varies from the “why bother” to lists of items pertaining to a subject area topic or theme being studied in class, through to essayist texts. There is little evidence of idea development." "Some students in this same class have created personal weblogs, but these are uniformly underdeveloped and none of them indicates any evidence of significant personal investment." Since then (almost a year ago), I have also tried to involve students in blogging with limited success. I recognise that I have resorted to the obligatory (homework and assignment) blog entry that the authors of this article refer to, although I have seen examples of writing which would have been difficult to obtain if I'd asked for traditional assignments. I recognise too, however, that there is a fine line between encouraging students to write in a weblog, and forcing them, when setting assignments. During the end of one blogging experiment (http://image-sound.blogspot.com), I gave students the choice of using the weblog for their assignments , or giving them to me hand-written or typed. Some students continued with the blog, but a lot of them preferred to hand me their work. It was as if they did not trust the technology. During the last computer class, I asked these students to answer some questions about the blogging experience, and their replies can be found on their student blogs. I haven't had time to compile and analyse the results, but when I do, I'll publish them here. The authors of the article mention hat it is not their intention simply to criticise the school blogs, but simply draw attention to the fact that although a lot of these are "earnest attempts to meld new technology use, student interest and school work", they "risk killing the medium by reducing its potential scope and vitality to menial school tasks in which students seemingly lack any genuine purpose." Finally, the article includes a link to the authors' blog they keep for their students, called everyday literacies . This article by Cory Doctorow discusses blogging as an evolution of bookmarking, which is a link I'd never made before. As Cory says, "I used to bookmark this stuff, but I just ended up with a million bookmarks that I never revisited and could never find anything in." I've mentioned this site before, but it's well worth listing again. Mandarin Designspecialises in "Web and Blog Design and Development" and has easy tutorials for weblog oweners who are looking to add something special. It could even be used with students with blogs if you have a group interested in playing with the design. Inge Anna Koleff of Austria has compiled a list of Weblogs or Blogs and related tools and articles as part of a seminar. "It is often observed that a wide and widening gulf exists between the forms of literacy students engage in within school settings, and the manner in which they engage in them, and those they encounter in their worlds beyond school." In their article based on a conference presentation in Melbourne last year, Colin Lankshear and Michele Knobel discuss the hows and whys of the above.mentioned statement, and what uses today's teenagers use the emerging technologies for. Amongst other things, they examine why in their experience emailing (which is so popular with teenagers outside of school) proved to be unpopular when used in school context. 1. Weblogs which are used to link to other sites and which include commentary. 4. Meta weblogs (such as blog-efl) which are weblogs about weblogs. Wikiversity - "a free, open learning environment and community. You can find online courses about many different topics here, and create courses of your own." The BBC - collective - community, which acts as a space for "exchanging views on new music,film and culture" now has a weblog service for members. It's a basic tool, but it shows just how blogs are becoming more and more part of standard websites. The ColorMatch Remix is a great tool for trying out variations of colour for any weblog template redesign. "The first step for teachers is to try out blogging for themselves. In this scenario, teachers cannot expect their students to do something that they are not willing to do themselves. Each teacher will have his or her own reasons for starting a blog. These reasons must be clear or the blog will not serve the learner’s language development. The blogs can be as general as a journal of daily thoughts, or be more specific in nature. The teacher should prepare beforehand, an activity that will be a catalyst for the language learner’s needs. " Thnaks to Anne Davis at EduBlog Insights: for this link to an article in The Daily Northwestern and the blog, which student government leaders are using to encourage students to participate more. "Please respect these guidelines. If they are disregarded, we may have to require you to log in to post comments. 1. No personal attacks. Criticise the people's work, attitude, ideas, platforms, the organization, committies etc, but don't use personal insults." Wikibooks: is a project whose aim is to develop "free, open content textbooks, manuals and other texts." They "currently have over 80 textbooks in various stages of development, of which every page is open to your revision and addition." Thanks to Stephen Downes for the information about this summer conference that aims to engage as many edu bloggers as possible to remotely participate in a presentation at the June 2004 New Media Consortium Summer Conference in Vancouver. The idea is to try to get away from a "stale conference presentation" by involving as many edubloggers as possible in a presentation "to show the power of using a discrete series of "small" often free/open source technologies" in an educational context. They have started a list of participants already confirmed for the presentation which will take place on the 17th June. ...iain... - Bravenet Web Journal: "In the EFL classroom in Spain or Italy you can expect the students to jump at discussion based exercises and start arguing with each other. Here one has to spoon feed students the English and some students have complained that my feeding technique is too laid back." Lockergnome's RSS & Atom Tips: "Stay up-to-date on the latest RSS & Atom news with Lockergnome"
English Notes, Musings, and Observations: "I am curious (actually I wanted to say I wonder...) if a sentence that starts with 'I wonder...', 'We are wondering...', 'They were wondering...', and so on should end in a period or a question mark?" The eprofe blog answers this and others, and makes very interesting reading. "While weblogs are normally public, free tools such as Blogger can be used for private, expressive writing. Students need only choose "no" when Blogger asks if they want a public blogsite, keep their site's location on the web secret, and exchange the URL only with the teacher, resulting in a private electronic writing space where they can be free to express the personal. However, to use blogs merely as a tool for private journaling is to privilege our understanding of journals as private writing spaces without considering the benefits of weblogs as public writing." 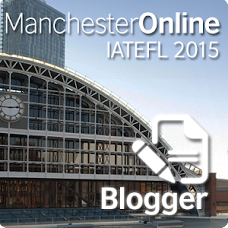 There's a lot more here of interest to ELT teachers. verb ("Golly, I just spent my whole afternoon blogging"). ring right. I can't quite put my finger on it, but it's there. The Washington Monthly: "So what are blogs good at?" The new Blogger relaunch is more than a facelift. There are new templates to choose from, but this is just the tip of the iceberg, and there are other features that have previously been provided by other weblog providers, or as add-ons to Blogger by third parties (such as the comments feature). I will be playing around with blog-efl to take advantage of this at the weekend. Turning the Tide: "The official weblog of Noam Chomsky, including exclusive, original observations drawn from personal correspondence, ZNet Sustainer Forums posts, and direct blog entries"
The conclusions: That..."maybe blogs were a new form of 'narrative' that promoted more personal, self-reflective style of writing and less of a 'debate' and more 'active listening' than you sometimes get in threaded discussions. A few others seemed to see potential as a journal tool, and as an eportfolio tool. But there were some really valid observations about difficulties that blogs present: as they stand now they can be labour intensive for the instructor or administrator to set up for each student to have an 'individual' site; there are some really valid concerns about student privacy and exposing the students to online 'predators' or the potential for students to stir up public controversy online." Materials Education 12 Guides for Lecturers is not weblog-related, or even EFL/ESL related, but it does have relevance for those involved in higher education materials writing. This article in Techlearning explains how an American soap opera is being used to teach Spanish. There is also an example lesson plan, which could be adapted for an english classroom and soap opera. James Trotta's Blogs for learning English + teaching English "provides links to blogs that can be used for learning English + teaching English because ESL + EFL students are welcome and encouraged to post comments on each blog. Please remember that the bloggers themselves welcome comments from people learning English, but that the owner of each blog listed takes no responsibility for other people leaving comments"
This is a great introductory site for students. My experience has shown me that lots of students just don't get the idea of blogging at first. It takes a while for them to understand just what they're supposed to do. This could be a solution to that, if, before asking students to get their own blog, they visit this site. All we need now is a worksheet/online activity to take advantage of the information on the site. What do you think, James? APPI 2004 presentation slides available. They were used for a presentation on using blogs in EFL and are well worth a look. R-efl-ECTIONS seems to be a new blog by an EFL teacher. This seems to be a growing trend. The E-Learning Guide to Blogging and RSS is another 'start here site' that provides a well-organised and easy-to-follow introduction to blogging as an e-learning tool. Jill's Blog review grade descriptions could easily be adapted for use with ESL/EFL classes if you set a blog review as an assignment. Thanks to Anne Davis at Edublog insights for the lead. "We are using weblogs but in most cases our students are not blogging, per se. Our current educational system is not ready for that big of a leap, and we have much to teach our students before they can learn how to speak responsibly, yet forcefully. That's a whole other discussion so back to the writing focus. Weblogs are unique spaces for us to use in education. We can use weblogs with students to make writing THE focus. We can publish quickly. We can set up an audience for them. We can give them ownership and best of all we can give our students a rich and diverse array of writing experiences. It's a way we can make writing a joy and let our students know that their writing matters." Moodle is an open source CMS (Course Management System), often called VLE (Virtual Learning Environment), that has a journal module incorporated. There has been discussion about converting this into a weblog. It seems that the module would give the appearance of a weblog and would work in the same way, but only be available for use by those enrolled on the course. There is also the option of keeping the journal private, so it can be used only as a means of correspondence between teacher and student. I am exploring this for the next academic year, when I will be running an online version of one of my courses, and I'd like to use a VLE with weblog funcionality. Moodle looks like an interesting place to start. Does anyone out there have any experience of this / tips / alternative suggestions? I'd love to hear your comments. Linguistic Life is an ESL blog from a Michigan-based teacher. "My own class seems to be keeping up their blogs well. No doubt a large part of this is due to the fact that updating their blogs at least 3 times a week is 15% of their grade. However, I do not think that they would be so inclined to keep it up if I had simply told them it was a requirement and they had to do it. I spent a lot of time explaining why I thought this was an important thing for them to do, and how it could help their learning. I told them that writing on their blog forces them to think in English outside of class, but it lets them think, and write, about subjects that interest them. Constantly practicing their English writing will help their reading, speaking, listening, and grammar as well, because putting their English to use helps them remember vocabulary, and notice grammatical structures they have already learned." "I get to my class, to find that half of the other trainees have deserted their regular class to join mine...result...not enough handouts...doh! I've got to say that the 3 hours went REALLY well from my perspective, though I'm sure any negative feedback will arrive tomorrow. The really scarey bit for me was the realisation 2 hours later that I had been unwittingly inspected by the Ministry of Education, but I think it should be ok, even though this woman had a face like a bag full of spanners." He also writes a vivid account of the recent troubles in the south of Thailand. Knowledge Tree - Blogging to Learn: "
Have you considered using blogs within your pedagogical practice? Do you know what a blog is? This excellent article makes a significant contribution to the flexible learning debate. Anne Bartlett-Bragg describes the phenomena of blogging, the process of blogging and how it can be used to enhance learning." How do I get one?" owrede_log: What's the blogging point? "Almost every examples I have seen of serious student blogging, took place because running the weblog was more or less a requirement in the course. Students that start (and keep) a weblog without 'formal requirement' are quite rare and only a fraction really blog in relation to their learning goals at all...And even if students are blogging: few of them really will use a self-reflective style that actually displays learning progress and potential stepping stones." "before "personal publishing" can be a valuable tool and students really get more process oriented, we need to introduce a learning environment where teachers change their evaluation method departs from a result orientation as well"
http://blogontheweb.com/eprofe/: "English Notes, Musings, and Observations"
Melanie Segal has recently started an ESL/EFL related blog called Where is the love? which takes peace as its theme. This, and other blogs can be found on the EFL/ESL blog ring, which Blinger has just started up. Nice idea, Blinger! Although the workindex article Learning Goes Mobile is aimed at a professional context, there's nothing to say that in the future, students can't use mobile technology to receive learning support. The way mobile technology is going, soon all mobile telephones will have facilities (document readers, audio players) that could be exploited by educators. Perhaps it is too far fetched now, but I'm sure it won't be in a couple of years. Obviously, the problem is the same as always - that not all students will have access to these devices. But, it could be interesting in the future to try out a blog aimed at students who have access to these devices. Weblogg-ed - Using Weblogs and RSS in Education : - Will Richardson has posted a useful document : RSS: A quick start guide for educators - RSS is something I've avoided so far, despite the comments / suggestions of many on blog-efl that I should provide a feed. This I promise to remedy after the Easter holidays. "Blogs for learning English teaching English or ESL EFL friendly blogs provides links to economics blogs, travel blogs, and many other types of blogs. These blogs can be used for learning English teaching English because ESL EFL students are welcome and encouraged to post comments on each blog. " "the first time you teach something, you learn something. The second time you teach something, the students learn something. The third time you teach something, no one learns anything." "You've authored a document and you'd like your peers to review it. Quick Doc ReviewSM gives you an instant private space for gathering comments on any HTML document (Microsoft Word documents too). Your group can comment on each paragraph, directly within the document, and you can also display, sort, and print the comments separately. Comments are all in one central place. This is true collaboration, much better than mailing documents around and having people make comments in isolation. And it's private, but still easy to access." "Weblogs are just too varied, too idiosyncratic, to fit into an existing box. Industry analysts might call this disruptive technology because weblogs have changed personal publishing so profoundly that the old rules no longer apply. We are at the beginning of a new age of online publishing "
"In discussions with students about why so many (at least on our campus) are so uncomfortable with blogging and resistant, we had some provocative conversations about accountability - not everyone wants their words published online where anyone can see and you are held accountable for what you say"
...from a summary of a much longer article entitled I'm Blogging This: A Closer Look at Why People Blog. "Many view the ePortfolio as the future of learning, a powerful aid for personal development. The ePortfolio can serve as a tool for learning, assessment, career management and knowledge supervision." "The one greatest differentiator of a weblog from a paper journal is this: it can connect to ideas, documents and material created by people all over the world. Tough to do that with a spiral-bound notebook. The literature of humanity is filled with references to 'magical books' which can effortlessly transport the reader to a multitide of new worlds simply by touching a page or looking at a picture. Each weblog is just such a book -- by simply touching a link, we are whisked off to yet another new sphere of knowledge that is one of an apparently limitless number of unique linked worlds." "Edublogs and their associated literature now constitute some of the richest lodes of online learning resources available. This edition of WWWTools for Education can do no more than sketch a mud-map of the current territory, scratch the surface a little, and point to some tools for delving deeper. " "Furl is a new web browsing tool that lets you save and organize thousands of useful web pages (you know, the ones you want to save for future reference but then can never find again) in a personal 'web page filing cabinet'. Once saved, you can effortlessly find any page again later using a powerful full text search tool. With Furl you can forget trying to save and organize dozens of bookmarks, forget saving web pages to your desktop, in fact forget everything except how to find a useful web page again next time you need it. " To investigate cross-cultural virtual communities of language learners"
Teresa Almeiada d'Eca will also be presenting her experience of using a class blog for 7th grade students at TESOL 2004. Teresa was instrumental in encouraging me to start blogging, and it should be a great presentation. Look here for more details: Internet Fair 2004 - Let's Blog! It's an interesting project, not only because she's using the blog with beginners, but also because, as she herself said: "We've been having an exchange with three Polish kids for several weeks now and have been using voice messaging from HandyBits. It's a great user-friendly tool!" I'd never heard of Handybits before, but it seems to add an extra dimension to Teresa's class blog, and it's freeware too. Check out Teresa's blog to find out more. "LookWAYup combines a multilingual dictionary, thesaurus, translation, and other handy tools. With a double-click you can look-up the meaning of a word, search it on the same site or the whole Web using your favorite search engine, and more! All that without leaving the Web page." Following on from James's idea, I've decided to look for Travel-related sites first, and have started looking at Blogorama, a Blog directory that's worth bookmarking. The first one isn't a weblog and doesn't allow comments to be posted on actual entries, but it does have a guestboook, and is a fabulous travel site: The Man in Seat 61 is a site all about travelling by train. Anne and Stephen's Big Adventure has now finished, but the blog of what happened to these two world travellers is still online and has a comments feature. North America by bike is also over, but still online. No comments feature, however. One way of approaching travel blogs could be by country. If the students choose a country and try to discover something about it's culture, geography, etc, as part of a wider project, it might be a good idea for them to check out some blogs about that country to get a more personal feel. They can always start by searching Google by entering the country they have chosen and 'blog' to get a selection. Rolling Rains Report : "Precipitating Dialogue on Travel, Disability, and Universal Design"
James Trotta at the Weblog in ELT group British Council Search English site is doing some research on using blogs with students for reading. He is compiling a list of blogs by category, that allow for comments to be posted by students. This not only gives students extra reading practice, but enables them to get involved in a L1 community that appeals to their own interests. Great idea James! Hopefully we can publish the list shortly on the Search English site if anyone's interested in this. Just register for a password and go to the forum / file section. Meanwhile, I'll start posting here sites that meet the criteria. Please let us know if you know of any sites too. "Double-click any word on this site to view its definition, or enter it above"
Blogging about emergent purpose, she writes: 'Online communities are old-skool. The heat these days is around social networks, buddy lists &blogs "
Interaction: Lots of user interaction & interaction between related Drupal sites. Extensive use of RSS feed publishing & aggregating. Strengths: Informal, newsy, often personal. There are a lot of folks who are bloggers or participate in blog culture. Weaknesses: Like other news focused sites, if it isn't updated regularly, it becomes stale very quickly. Tips: ...the blog format can be a great way to humanize messages on an ongoing topic ...blogs have a 'note from a friend' feel to them -- much more personal than the same information presented in a web news or magazine framework. When using blogs, consider having a single 'voice' or a small group of voices do all posts, to reinforce the personal flavour of the blog." "The most-read webloggers aren't necessarily the ones with the most original ideas"
"Bloki is a Web site on which you can create Web pages, publish a blog, and host online discussions"
The conference will be held in Vienna, Austria, Europe, in July 2004. " Thanks to the Educational Webloggers Network for this. "Here are a few of the weblogs that have emerged out of the 'Creating and using weblogs in ESL/EFL' online session:"
"These are posts from Jill Walker's weblog jill/txt that have to do with blogs and teaching." "misbehaving.net is a weblog about women and technology. It's a celebration of women's contributions to computing; a place to spotlight women's contributions as well point out new opportunities and challenges for women in the computing field." "The purpose of this weblog is to show links to exercises that will be useful to ESL students in Structure 3 at Arizona Western College. Each link corresponds to a chapter from the textbook used in class"
The Imatge English Weblog is a tutor blog that has links to individual student blogs. I have been using weblogs with this group since October, and have made writing to them a compulsory part of the course. With this course, I have to set assignments every couple of weeks (it's a requirement of the curriculum), and so I decided to ask the students to use the weblog for this. The other reason why I decided to use weblogs with this class in particular is that the lack of classrooms in the polytechnic where I teach the class means that one of the three English teachers have to take the class in a CALL lab once every three weeks (we rotate). This was obviously a good opportunity to use blogs. You can access the individual learner blogs from the images at the top of the page on the Tutor blog. One task I asked them to do was to post one of their photos, or to select a photo from the Web and write about it. Pete's CALL Test Weblog: a weblog to discuss and evaluate CALL activities. "the power relationship implicit in a weblog might be unhelpful. Most weblogs are owned - they 'belong' to an individual or group. Insiders post content and outsiders comment on content...very different to an e-mail discussion list." "when done right...the blog is a tool for building community. The trick is to turn the audience into the speaker. A well-structured blog inspires both reading and writing. And by getting the audience to type, candidates get the audience committed. " What makes an online community work? I've become interested in this recently, especially (but not exclusively) online communities that are Virtual Learning Environments (VLEs). The communities that seem to be successful seem to offer a personal space for the member. This certainly adds to the feeling of involvement that the member has. This is true of the online community for education professionals Tapped In, which provides each of its members with a virtual office. You can link to other offices, and you have a personal filespace (as you would have in a real-world office). All-in-all, it works well, and increases the level of involvement you have in the community. Another successful online community that offers this personal space is Book Crossing. Each member has a personal page, which they can use to write whatever they want, apart from any standard details they want to share with people. The basis of this community tends to be local, but with the possibility of linking internationally. Neither of these communities use weblogs, however, although I am sure that we will see more community spaces adopting weblogs as part of their site. There is one I came across (Student UK) which used blogs as the way of linking members together and offering members this personal space, which seems to be one of the keys to any successful online community. Unfortunately, this site has recently run into trouble and has shut down, although it could be reopening if they find a sponsor. Does anyone know of any other community (VLE or other) that uses blogs as a tool? What makes a blog different from a forum? I remember that the first time I used weblogs with students, the comments I got from some of them was 'Oh! It's a forum'. Since then I have heard this on other occasions from other students. That got me thinking about the similarities and differences between these two tools (I won't repeat what is written elsewhere - if you want to join in a discussion about this, or read what others have written, then I'd encourage you to go to the forum at the Weblog in ELT group over at Search English) . One of the things that was established during this discussion is the essential difference between the two: A forum exists for debate and discussion, while a blog's purpose seems to be better for personal opinion. What this means is that 1) while a blog only needs to have one voice to be a success, a forum only succeeds when it has lots of people contribute. 2) a blog needs to be updated regularly. This is not so critical for a discussion forum. However, there seems to be a grey area. There are group blogs that thrive on discussion - a blog is a great place for topical discussion about one thing, although it's not recommendable to try and conduct several different discussions on the same page as this would be difficult to follow. This is solved by taking discussion of entries to a separate comments box, something which adds a forum-like feature to blogs. Then there are the discussion forums which shows posts on a topic in chronological order - this is true of Search English, for example. The Guardian's The Talk does this too, and if the threads are too long it only shows the most recent postings (as a blog would do). This makes reading the entries to a thread much easier - there is nothing worse than finding a discussion forum which requires you to click on each separate post to open the messages. Fortunately, this type of forum seems to have disappeared. The Journal's article Content Delivery in the Blogosphere talks about this too, and sides with blogs rather than forums : "blogs provide an environment that is more advanced than simple discussion forums"
"well, if you just teach from the book every day then of course. But, even if the books are perscribed to you then you can still adapt them and make the most of the material. Or rather, you can if you care and are interested in how people learn languages and what makes an interesting classroom"
I reply, 'Erm....yes it is, Carlos. But do you understand the present perfect?'" "MOBIlearn is a worldwide European-led research and development project exploring context-sensitive approaches to informal, problem-based and workplace learning by using key advances in mobile technologies." Thanks to Bee for this : :: Bloggar :: is "an interface between you and blogger which gives you more flexibility to edit your posts." "The Friend of a Friend (FOAF) project is about creating a Web of machine-readable homepages describing people, the links between them and the things they create and do." "Since 1998 electronic discussions have played a valuable role at the World. By promoting consultations with the public, they have furthered the vision of the Knowledge Bank, which is about putting in place systems for capturing knowledge more effectively." Internet Time Blog: Edinburgh -- Etienne Wenger: "The three aspects of social learning are the Domain, the Practice, and the Community. What, how, and who." "PowerPoint. How many in the audience use PowerPoint at least once a month? (Most of us.) How many learned it by attending a course? (1 person) How many learned via eLearning? (2) How many learned through trial and error and/or asking people for help? (45) This is a typical finding." Would you get the same result if you substituted 'Powerpoint' for 'weblog'? "I absolutely LOVE WEBLOGS!!! The webloging experience for everyone is so great for education subjects, or of course to share your feelings. Ms. Davis' group allows me to really express my feelings about the subjects on the news and my side of the story. You might think that you can just write it down on paper and have the same effect. If you have a weblog though, you can write AND get a response from other viewers. " Emily is one of Anne Davies' students, and part of her Thinking and Writing Wrinkles Group, which is a very successful class weblog. "Articles about the convergence of blogs, k-logs, and portals"
"Drupal is an open-source platform and content management system for building dynamic web sites offering a broad range of features and services including user administration, publishing workflow, discussion capabilities, news aggregation, metadata functionalities using controlled vocabularies and XML publishing for content sharing purposes. Equipped with a powerful blend of features and configurability, Drupal can support a diverse range of web projects ranging from personal weblogs to large community-driven sites." "I've not yet, and may never do so, reach any conclusions about what I'm considering currently. The more I look at, and have experience of using or enhancing, weblogs the more educational potential I see in this genre. I'm certainly not going to put them forward (yet) as full-blown Learning Management Systems but as candidate engines for alternative and perhaps more satisfactory virtual learning environments? ... probably yes." "This blog belongs to a group of students from all over the world who are studying in the Learning Skills Unit at RMIT, Melbourne, Australia. " "You don't need complicated online learning packages to set up a simple online course on a blog. Your own imagination and a group discussion board is enough to start you off. The versatility of a blog means ...Your blog can extend your teaching, and your students' learning, beyond the walls of the classroom into the heart of the internet." The ELT weblogging group at the British Council - SearchEnglish Engine is another place you can go to to find information and share views about blogging in EFL/ESL. Apart from signing up for content delivery (you decide when and what subjects you'd like to be informed about), there are also forums you can join in (you need to login before you can post), a noticeboard, and a shared file area, which will feature soon some activities you can use with classes. "Blogfeed creates an RSS newsfeed from the HTML file of your blog. We created this to generate RSS feeds for Blogger powered blogs, but Blogfeed can be used to create an RSS file from any HTML document." A useful chart comparing different weblog software that teachers might want to use with students, etc. The tools compared are: Blog-City, Motime, Tabulas, and Xanga. Blogger does not feature here. I have been following the discussion on the TESOL EV ESL Blog group lately and it seems that Blogger does not have a good reputation among teachers as an easy tool to use with classes. I think this is mainly due to the necessity of having to manipulate HTML code (in the template) if you want to add links, and having to use an outside service for comments or a tag-board. You also need to look for an outside website if you want to post photos. "Hi we are room 209. We are students in the Chicago Public Schools and we maintain this blog. This blog is a way of asking questions, writing about the things we are learning, discussing ideas from many sources, (books, blogs, letters, interviews) and reflecting on those ideas"
tBLOG - Idioms Are Fun! "My intention is to suggest some possible activities to use them with our students as well as providing teachers with some links to excellent resources on blogging." "This article is a concise and accurate introduction to the concept of the 'trackback' in blogging"
"Two types of technologies are about to merge. The technologies are content syndication, used by blogging websites around the world, and social networking, employed by sites such as Friendster [http://www.friendster.com] and Orkut [http://www.orkut.com]. They will merge to create a new type of internet, a network within a network, and in so doing reshape the internet as we know it." "This if my ESL Blog as I undertake an MA in TESOL at the University of Melbourne, in Australia. Argh!!!" "On a lark I did a google search for linguistics ESL blog and discovered I'm number one. Pretty good for a blog that isn't even two weeks old. I have no idea how I did it." "Speaking about the English language, the pitfalls, the pleasures, the rules (or lack of them thereof), the art (poems, short prose, puns, 'proetry'), and so on." You can now find the first article 'Why blog?' in the documents section of the ELT Weblog group at British Council - SearchEnglish , as well as discussion forums relating to different aspects of blogging in ESL & EFL. Search English is a British Council "news, information, and networking tool for English language teaching professionals.' Apart from offereing discussion groups on all manner of subjects (CALL, online learning, blogging, etc) it's a free service, which you can configure to bring you the news / lesson plans / articles / etc. that you are interested in. If you haven't visited it yet, then I recommend you do so. "ESL blog aims to provide news, reviews, opinions, and links regarding learning and teaching English as a second language and English as a foreign language. " I have been running a tutor blog for my ESP students studying Image & Sound. I introduced them to blogging in October, and they have set up learner blogs (see links on the tutor blog) and have used their blogs as a way of submitting assignments that can be then read by others. I have been looking at ways of presenting corrections to students, writing comments to their weblogs, and have told them to feel free to use the weblogs as much as they like. A large proportion of these students don't have access, or have limited access to the Internet from home, so they have not been using the blogs much. Still, it's been an interesting experiment and most of the students seem to be happy using blogs. "These brave future teachers are forging ahead into unknown technology territory this semester"
After a few technical hitches, I've now started posting to the Weblogging subgroup at the British Council - SearchEnglish Engine, and I'd like to encourage you all to join me over there too. Search English is a free service offering customised news, information and networking possibilities for English language teaching professionals. I hope that the Weblogging subgroup there will give us a place to discuss and debate our weblog experiences, experiments, etc, and have decided that one of the first things I am going to do is to upload some short articles for beginners who are interested in weblogs and want to get started. Another good thing, would be for those with weblogs to write a short piece about their experience. Getting in touch with others who had started blogs really helped me get started, and made me avoid some of the traps that a beginner can easily fall into. This is the first part of a two-part online course, scheduled for 25 June - 9 July 2004, which promises to be both an interesting and useful introduction to YL blogging. I took part in the same organisation's online e-moderating course last year and found it highly stimulating. Blog-efl has been overhauled and updated. If you haven't joined Search English yet, I recommend doing so - it's a great way for teachers to be kept informed about professional development and for sharing resources, ideas, etc with ocolleagues.